When I’m putzing around for pleasure, I don’t often rely on GPS for navigating. 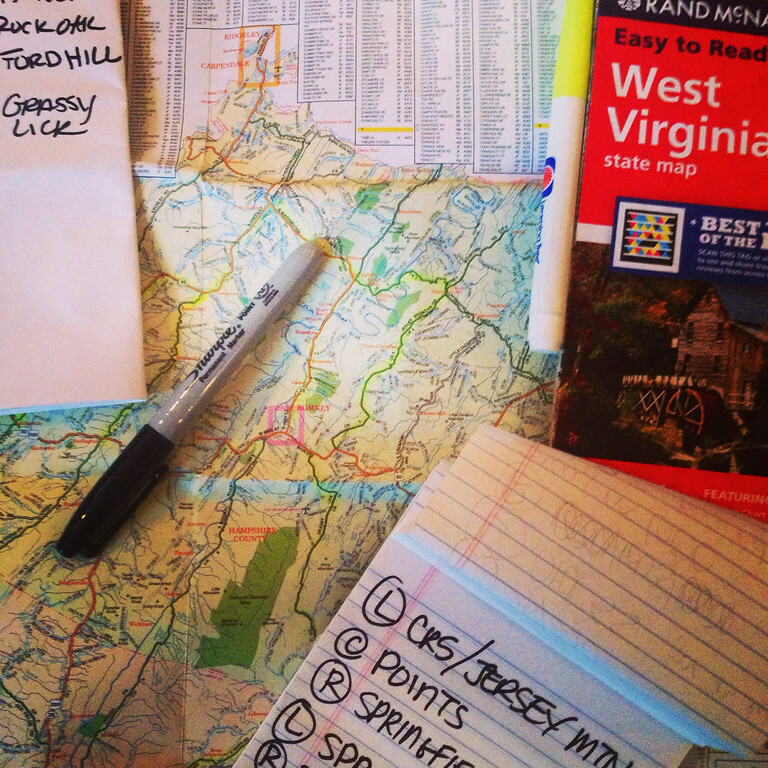 I stick with the old standby – paper map, highlighter, a sharpie and a scrap of paper. It never lets me down and is as easy as pie. This past weekend we took a much needed road trip to West Virginia to stretch our legs a little. While there, I found a county map in a gas station which for me is like the holy grail. County maps zoom in on the local roads that your higher level state maps don’t often feature. You know, the little wiggly roads. That was $5 well spent. Also, I finally had the opportunity to meet up with Kathy from ToadMama.com 🙂 More trip posts to follow, so in the meantime mosey on over to read her post about our ride together. Great simple post! Maps are good!! Like you Rachel, I love the local maps, especially those with locally known, yet lesser known attractions and eateries. Many a wonderful discovery has been made with these paper tools! Glad you got to meet up with ToadMama to. The back roads, quirky travel blogger world is not so big and none of us are in competition. We love to share our experiences and, when the occasion affords itself, sharing in person is always better!! Stay safe and enjoy the ride!! I refuse to use GPS. It ruins the experience of travel for me. I love maps and even enjoy getting lost once in a while. In current America, you’re never too far away from civilization. I’m a map girl, too. The Delorme state Gazetteers are usually pretty good. I like using MS Streets and Trips software to tie it all together, calculate total mileage, and estimate duration. I also like to check Google Maps street view to see what intersections look like, just in case the road has a name and a number, but only one of those on the sign. VA has it’s way-finding challenges, too. I love maps and don’t use a GPS. I also love WV and I love your posts! Thank you. Maps work much better for me only if you study them before heading out or you have a navigator. Especially in your part of the country. I would be wandering the backroads of PA for days without the GPS with all of the tiny roads going here and there and seemingly only running in disconnected circles. Here in Alaska, things are much simpler. One road north, one south and one towards Canada. I’m mighty fond of paper maps: As with used books, their personalities develop with age. Besides, there’s no big loss if a paper map gets dropped, left out in the weather, or stolen (honestly, who steals a map?). Often I’ll supplement my pre-ride research by browsing through Google’s satellite view. Out here in the wild west (if only…), our fantastic land formations are numerous, and our early history was defined by precious metals mining. In satellite views, land formations are apparent, and even if old roads are overgrown, washed out, or plainly primitive, tailings piles are obvious for their usually distinct color compared with the surrounding terrain. And where there are tailings, there’s usually fascinating old equipment and other debris, weathered structures, and gaping shafts ready to swallow whole the inattentive wanderer. Paper maps are great… until you’re in the middle of nowhere, with no shelter to be seen for miles, and a huge rain storm in your rearview mirror. When it’s one of those rides where you’re literally racing the weather (or caught in the storm), I’ll take a handlebar mounted GPS in a ziplock bag over a paper map in a heartbeat! Though I totally confess to loving looking over a map and highlighting the squiggly roads that need to be explored. I have one pinned up in my garage… A time and place for everything, right? Maps are for Squares… I tend to stick a finger in the air and let my conscience be my guide.. as long as there are some geographical boundaries … and a full tank of gas ….